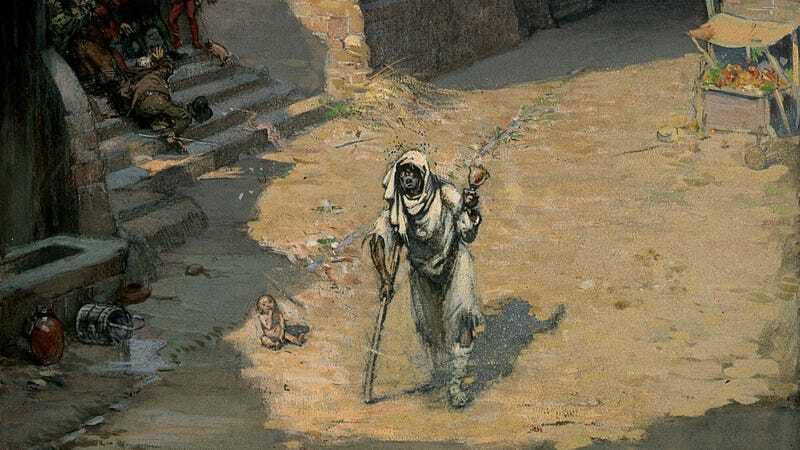 Painting of a person with Leprosy ringing a bell to warn others of their presence. Leprosy is one of the oldest known diseases to afflict humans, yet its origin is mired in controversy. A new study, in which 10 strains of the disease were detected in the remains medieval Europeans, is now complicating the picture even further by pointing to western Europe as a potential launching point for leprosy. What’s more, the evidence also points to squirrels as a major contributing factor in the spread of the dreaded disease. Archaeological, historical, and paleontological accounts of a sickness consistent with leprosy date back thousands of years to Africa and the Middle East. Caused by the bacterium Mycobacterium leprae, leprosy became widespread in medieval Europe, peaking between the 12th and 14th century and finally declining by the 16th century. Leprosy, also known as Hansen’s disease, affects the nerves, skin, eyes, and lining of the nose, and it’s still endemic in many parts of the world, with 200,000 new cases reported each year. The origin and dissemination of M. leprae remains a mystery, despite many attempts to reconstruct its past from historical and archaeological sources. A popular theory is that it originated in East Africa or the Levant area of the Middle East, moving around the globe as humans traveled along migration and trade routes. Other evidence points to its origin in East Asia. But as new research published today in PLOS Pathogens points out, medieval Europe was an absolute hotbed for the disease in terms of its genetic diversity. This latest research doesn’t prove that leprosy originated in Europe or anywhere else for that matter, nor are its authors making this claim, but the presence of 10 different strains of leprosy in western Europe during the Middle Ages, including the oldest genetic strain found in the UK, certainly hints at this possibility. And then there are Britain’s red squirrels to consider—but more on this tantalizing clue in just a bit. Skeletal remains showing evidence of leprosy from the Odense St. Jørgen cemetery in Denmark, which was established in 1270 and existed until 1560. For the new study, researchers from the Max Planck Institute for the Science of Human History at the University of Tübingen, EPFL Lausanne, the University of Zurich, and several other institutions analyzed the remains of 90 individuals buried across Europe and dating to between 400 AD to 1400 AD. All of these individuals exhibited skeletal deformations consistent with leprosy, including deformations in the face (particularly around the nose), as as well as in the toe and finger bones. These leprosy cases came from various parts or Europe, including Italy, Hungary, the Czech Republic, and the UK. Working with these remains, the researchers extracted, identified, and reconstructed 10 medieval M. leprae genomes, several of which were previously known to science. The researchers also found multiple instances of leprosy strains in the same cemetery, showcasing the diversity of the disease as it made its way across the continent during this time period. A big surprise was the high diversity of the ancient M. leprae strains recovered from the samples. “In particular, we did not expect such a diversity within the same cemetery, as we found three major lineages within the St. Jorgen cemetery in Denmark,” she said. Prior to this study, scientists thought the disease only existed as several strains, only two of which were present in Medieval Europe. This latest research is now challenging that assumption. Skeletal remains from Great Chesterford showing evidence of leprosy. This is the oldest known case of leprosy in the UK. “This supports the hypothesis that squirrels and the squirrel fur trade were a factor in the spread of leprosy among humans in Europe during the medieval period,” said Schuenemann. But scientists still aren’t sure if humans infected squirrels with leprosy, or if it was the other way around. Further complicating the matter is genetic evidence from 2014 suggesting early modern humans were already carrying leprosy when migrating out of Africa around 100,000 years ago. The new study doesn’t resolve any of these issues, unfortunately. Why was leprosy so diverse in Europe during the Middle Ages? And how did it get to the UK so long ago? Unfortunately, no ancient genomes from key regions in Asia or elsewhere are currently available, preventing further testing of current hypotheses. Schuenemann says it’s crucial that scientists locate more ancient and ancestral strains to push this research further. Until that happens, however, the story of leprosy, and how it came to afflict our species, remains an unresolved mystery.